The Global Climate Action Summit will bring leaders and people together from around the world to “Take Ambition to the Next Level.” It will be a moment to celebrate the extraordinary achievements of states, regions, cities, companies, investors and citizens with respect to climate action. It will also be a launchpad for deeper worldwide commitments and accelerated action from countries—supported by all sectors of society—that can put the globe on track to prevent dangerous climate change and realize the historic Paris Agreement. But what about the effects of climate change are already happening? What can communities do now to become more resilient to severe storms and flooding? Stop by the Adaptation by Design Exhibition and learn about The Resilient by Design | Bay Area Challenge which brought together local leaders, community residents and youth, and international experts in design, ecology, engineering and architecture together to develop community-based solutions in nine communities around the Bay Area. The Resilient by Design Teams brought collaboration and innovation to life as communities around the region grappled with the complexities of planning for long-term impacts from sea level rise while balancing current challenges like transportation and housing plaguing the region. At this exhibition, you can learn more about about the proposals for making the Bay Area more resilient, hear from the people behind them — and help chart a way forward to a more resilient future. Exhibition and Storefront open 12pm - 7pm, Monday - Friday (Except on Tuesday when the storefront will open at 3pm). In partnership with the East Cut CBD, Hassell Studio and the Metropolitan Transportation Commission, Resilient by Design bring you the Resilient by Design Storefront, a space to converse about Resilience related topics. The Storefront will be hosting a number of panels, receptions and other events during the week of the summit. Stop by to learn more about the 9 innovative proposals to design for adaptation in the Bay Area. 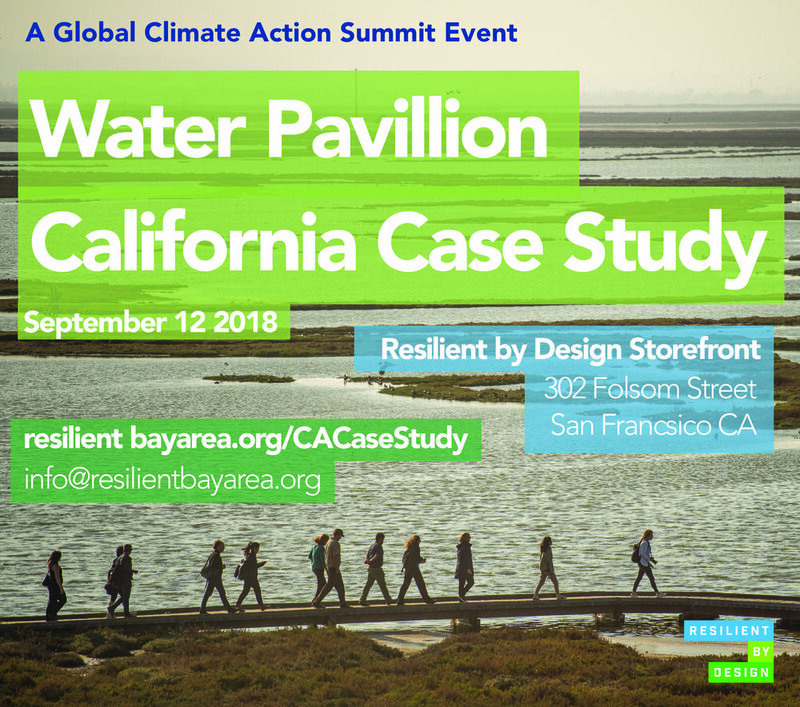 On Wednesday, September 12th, Resilient by Design is partnering with the Governor's Office of Planning and Research, Consulate General of the Netherlands, WaterNow Alliance, Department of Water Resources, and the All Bay Collective to put on The Water Pavillion: A California Case Study. This will be a series of panels about water related topics followed by an interactive Resilience Game Night.